The latest (a pirate story) is now planned, plotted, roughed and halfway comped (is that even a word?) – I’ll update this page and the blog with my process and WIP pics as I go. This came to me one night as I was doing some character sketches for another story…this is what tends to happen with writing (for me personally) – I can’t just sit down and think ‘I’m going to write a story’ as I will be as blank as the sheet in front of me…inspiration has to strike, I can’t strike inspiration. I wrote a plan…well actually I copied a plan and adapted it. Then I ignored it as I’m not very good at following things that go in a line. I also came to the conclusion that just because someone has written about doing something one way, doesn’t mean its the only way (which is partly why I’m writing this down – the more examples of the ‘process’ you see and explore, the more you realise its a personal thing). I doodled…lots of character doodling (‘but what do his feet look like’ kind of thing) – nothing detailed – just outlines and characteristics and then exploring them (‘but what if I made him fatter…and shorter….and with smaller eyes’ etc). I made a teeny weeny dummy…to help me break up the text (see pic below). 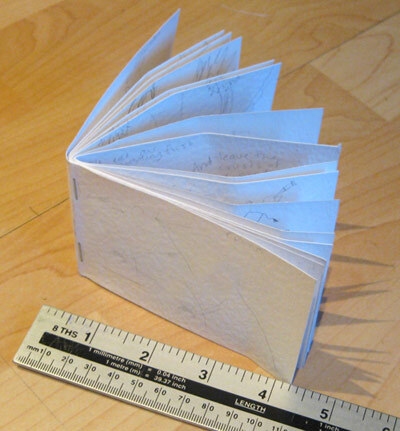 I decided on the shape of my book (short sided rectangle) and then I cut 8 strips of card measuring 8.25″ x 2.75″. Placed them all on top of each other and then stapled it all together in the centre so it looks like a little book. Then I used a dummy layout to help me identify which pages I’ll be using for the story and which will be taken up with covers, endpapers, info etc (I used Uri Shulevitz‘s layout). There are no planned dps in the book – I made that decision pretty early on. The intention was that the text would be hand rendered but that’s something that is still open to change. Sooo, I split the text up into 14 sections and have made the decision that the book will start on a single page and end on one with the 12 sections in between running across two pages (facing pages – one page for text, the other for illustration). I did what I always do with a storyboard (I did this for my college/uni work too) – I drew the first thing that came into my head for each section of text – my storyboard remains a work in progress and from here gets updated as I go. If I do it any other way I get stuck in a black hole that I can’t get out of. The whole process has to be organic from the get-go for me. Once I have a fully completed storyboard (remember, this is extremely rough at this stage and may even feature stick men), I get my sketchbook out and start working on whichever section takes my fancy. This is where I start exploring what I really want the illustrations to look like for each page – I do this until I’m happy with the composition, then one at a time I draw up a large s/s pencil drawing for that page. This has all the details that will be in the final illustration and is pretty much ready for painting. Then I set it aside and go back to my sketchbook and repeat the process for the next section I want to work on, all the time using my teeny weeny dummy as a guide to page numbers and text sections. For the comps, I’ve drawn everything (I have 14 pages) in outline only – I haven’t added any shading at this point as I’ll be photocopying these before I go any further with them and a couple will be painted for the dummy. The thinking behind that is that I’ll have the original pencil outlines to make any minor changes that might arise when I start to add tone without having to start over – erasing heavy areas of shading is not something that looks good afterwards. I had an idea for the cover just before I was almost finished with the comps, so I made some quick sketches (around playing card size) – I then drew up a s/s rough with shading to make sure I’ve enough room for the title text – I was happy with it so I’ve drawn it up (I haven’t drawn a full dps wraparound cover with a marked out spine – just a drawing the same size as the pages at this stage). I was going to draw a pattern for the endpapers but resourcefulness struck and I remembered that I have a repeat pattern perfect for this book that I did for a client last year – the client loved it but didn’t pay as they went bust so the illustration was never used so there is no problem with recycling it for other purposes. So the endpapers are ready made. At this point I had a change of heart – I was planning on using traditional media from start to finish but I’ve decided to go digital for no reason other than logistics – I’m having trouble with scanning. I’ve (badly) scanned all of my line drawings separately and saved them. I’ve also placed the text for each page into A4 size documents. The reason I’ve done this now is so I can gauge the ‘flow’ of everything as I work by making an InDesign document with everything in place – a digital dummy that from now on I’ll keep updating so I can keep an eye on things. I’m over halfway through the b&w rough’s with 2 colour pages left to do too. Before I started on the roughs, I decided to do a full colour version of the cover – I did this to keep me motivated. Seeing the cover in colour make’s me feel more like the book is a possibility rather than a dream so I picked out a colour scheme and saved the swatches in Photoshop so I can load the same colour palette for each illustration. If I was working in acrylic/watercolour I would have done a similar thing and picked out my colours beforehand – not a huge array, just 5 or 6 colours that I could mix all of my other colours from (including a red, blue and yellow). Colour schemes are a matter of personal taste – I have chosen a warm muted palette for my book. 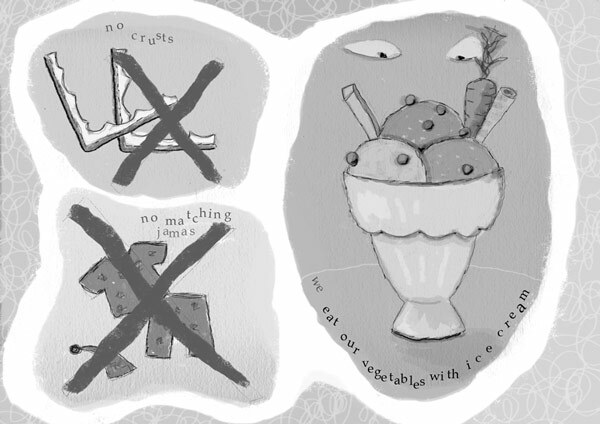 The dummy is now finished and saved as a .pdf in spreads. The two full colour illustrations took around 5-6 hours each (including tea-breaking, faffing and chin-stroking). I haven’t yet printed everything and made up a physical dummy as I am not yet approaching publishers directly as I would prefer to go through a literary agent if possible and the agents that I want to submit the book to first prefer email submissions. I have narrowed the agencies down to four where I feel my book would be a good fit by visiting their websites, visiting the websites of author/illustrators that they currently represent and reading the agent profiles (where available). So there you have it, my dummy process from start to finish – I hope this has been/will be interesting to you if you are about to start the process yourself. I’ve found writing about where and what I’m up to has kept my motivation up so if you decide to do this yourself, please let me know so I can link to your progress/process. As I was sitting here, stuffing my face delicately nibbling a doughnut, it hit me that I never actually came back and updated my book dummy adventures. For those of you that were following or just like to read a happy ending (well, more of a happy beginning in this case) I’ll do it now (as soon as I’ve finished this cake). As I mentioned in my last ‘dummy’ post, I digitally submitted it to four literary agents. I sat back and started to think about the next one but I had an email from one of the four the same week. I was completely taken off guard…brilliant! After speaking initially with Lauren I knew straight away that I was going to accept her offer of representation. The conversation was laid back, Lauren was lovely and I felt at ease to ask questions (even the stupid ones). As I’d done my research beforehand, I already knew that on a professional level, this was one of the four agencies I wanted most. At this point I withdrew my submission from the other three (one of them sent me a lovely email about my dummy and wished me well for the future too, which was nice). So, the update is, I was offered representation (literary and illustration) by Bright and I have to say, I’m over the moon about it. As for the dummy itself, it needs some tweaking…but it’s looking better with each one. And in between tweaks, I’ve written and started to develop another. My portfolio at Bright is HERE where you can also see a coupleof colour roughs from the dummy. Well, it would have been a newsflash if I’d updated sooner…As it stand’s, it’s just news. But great, fantastic, brilliantly-brilliant news. My little tiny book dummy is going to be a real book. I signed a contract with Caterpillar Books a couple of weeks ago and will be starting work in January 2012. I really enjoyed your dummy story, It really inspired me to get my stuff together for my own agent submission. Bonne chance with the publishers. Your work it cool btw.